This entry was posted in Reflection, Talking math with your kids and tagged 10 years old, algorithms, Griffin, lattice, mathematical thinking, multiplication, standard algorithm. Bookmark the permalink. I’m seeing this with my own daughters now that they are getting into upper elementary. When I was teaching eons ago, it took me a while to realize that it wasn’t so much that following the algorithm was the way to go, but that the student understood when their favorite algorithm was working for them or not. Being the Devil’s advocate, though, I wonder if the lattice method doesn’t necessarily help with place value, either. It, along with the standard and some other methods, are really just organizational tools to get to the answer. Seeing my own 5th grade daughter go through learning multiplication, and now long division, I’m finding myself asking her “Why?” rather than “What do you do?”. With what I do now, textbook industry, and writing the “Explain your thinking.” questions, I’m noticing that even coming up with the answers for the Teachers Editions is an arduous process. Helping my daughter answer those same questions is a lesson in patience. Perfect timing, as I too was just talking to my 2nd grade son (Charlie) about even/odd and adding two digit numbers vertically. Charlie: I learned about even and odd numbers are today. Me: Oh, what is an even number? Me: Neat. (I continue to pick a few numbers 1 through 20 and Charlie correctly says even, odd). What about zero, even or odd? Charlie: Walks away (which is what he does when stumped or just done talking about math. After a few minutes he walks back.) Zero is even. because numbers go even, odd, even, odd, even, odd. Me: Interesting, but no one is at the table. Maybe we can talk more about that later. Okay, lets pick a bigger number. What about one hundred, twenty-three. Charlie: Well, you can just look at the last digit. 3 is odd. So odd. Me: Oh, that is handy. I wonder why just the last digit. In one hundred twenty three, does the one represent an even or an odd? 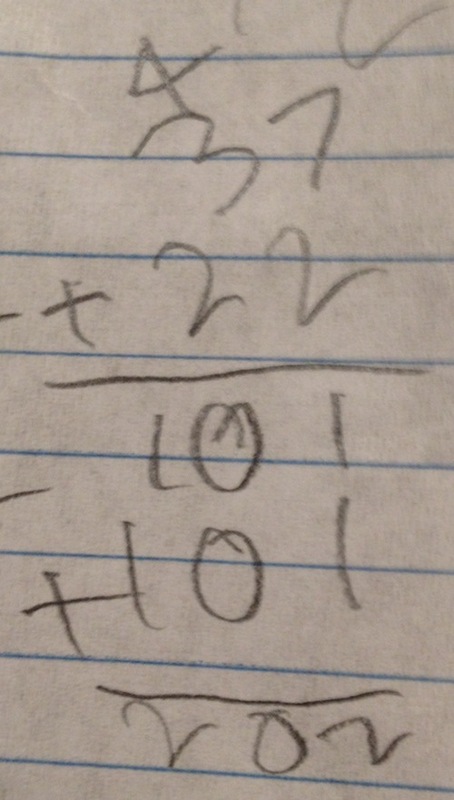 Charlie: Umm…one hundred and zero is even. Charlie: Twenty and that is even. Me: So I wonder why you can only look at the last digit? Charlie: Are we done? I am going to go draw. Me: Let me see your paper. Okay what did you do? Charlie: Well, the 1 + 1 is two. So I wrote down a two. 3+8 is eleven, so I wrote down the one. Me: So, you got 21. Charlie: What, wait. That is too small. It must be thirty-one. Me: Oh, really. What is ten + ten? Just to be clear, this post was in no way intended to be a defense of the lattice algorithm. I’ve written about that one, too. Do you think that part of the problem is that teachers don’t understand the connections between standard algorithms and the understanding behind the steps? I see too many teachers say “now here is ANOTHER way” to get the answer, rather than exploring the connections between them. Of course standard algorithms are efficient and do not require (deep) thinking. Do it right, get the answer. 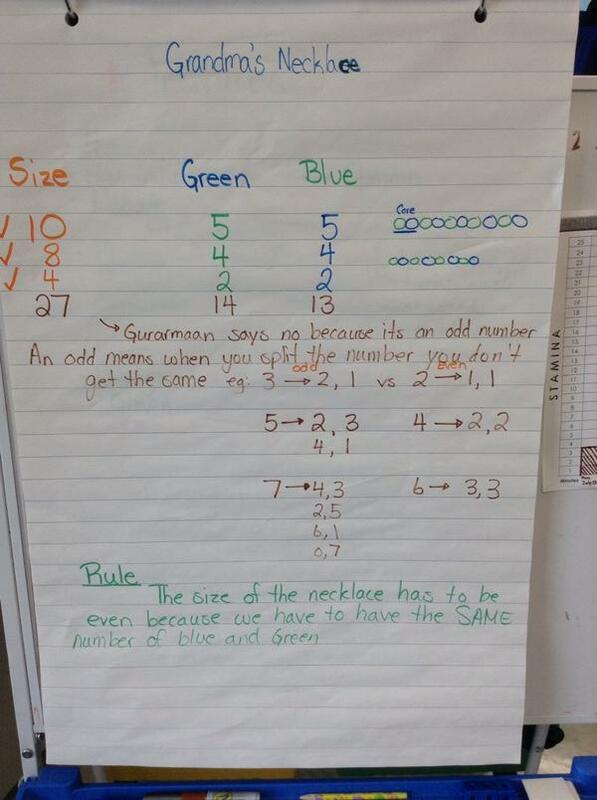 There seems to be a move towards expecting the poor kids to explain the standard algorithm. This is a mistake. Understanding it, which is useful as it increases the faith level, is a good idea, but is untestable. The standard algorithm does nothing towards explaining place value, it just gives the wrong answer if you don’t do it correctly, and also it wouldn’t work without the place value representation of numbers. I hate to think what the standard Roman long multiplication algorithm looked like. About your son’s approach, he doesn’t think much of the std alg. I saw no attempt to view the situation after the computer told him it was wrong as an invitation to ask “where did I screw up, then? “. I also hate to think what a mess your son’s teacher is going to make of long division !!!!!!! First I have to say that I love your blog and site for talk with kids. Amazing thoughts and great way of engaging your audience in learning. This has been an important issue for me in my school, as many of my parents and teachers feel that this was way math has been taught for years so it must be the best approach. However, like you I have seen too much research and own experiences to suggest that different. Personally, I believe that students need a deeper understanding of number sense before moving to an algorithm. I have my grade twos now adding three digit numbers in their head because they can manipluate the numbers to work. Now eventually practicality sets in and you use these made algorithms which make pencil tasks a lot faster. In my opinion students need to be doers of math not just doing math and for that to happen there needs to be more critical thinking about the numbers that they are using. Thanks again for sharing such wonderful ideas. Is it okay if I share this with others? I would take this one step further and say, why not give them a calculator. If we just want correct answers from something easy and organized, a calculator does a nice job. Great post. We dedicate a little time in my courses to alternative algorithms that support understanding of place value – partial sums and partial products – but we also challenge the idea of doing a lot problems using any algorithm just for the sake of getting good at the algorithm. That’s not really math…is it? I agree with everything you’re saying here — I have seen it first hand in my 7th and 8th grade math classes. What strategies do you use to introduce algorithms after students have worked out problems using number sense and common sense? Love this article. Hope you don’t mind, I’m going to share it with my Advanced Math class. These kids are good at following algorithms and formulas, but do not think nor want to think about what they are doing. On the bright side, they are beginning to see that math is not as “magical” as they once thought. Again, thank you for sharing your math stories. I am not a teacher , but I am intrigued that the use of the number line does not help the kids to understand that a-b = a+-b? I have never explicitly explained to my 6.5 yr old, but we have played games with adding negative numbers to positive numbers and I’m hoping that this will start to lay the foundation for the subtraction rule. In the UK, the kids use the numberline extensively in Years 1 and 2 and I assumed that this would help them understand that subtraction is just like adding negative numbers. Sorry if this is a really naive question, just trying to get my brain around the ‘new maths’ (which by the way I do like and think kids enjoy much more than our ‘old maths’). Out of curiosity, how do you explain a-(b+c)= a-b-c and at what age/grade are your students in? The number line is great for understanding adding and subtracting when you can get the kids to invest in it. I probably use a number line in my 8th grade class once per day and my Algebra 1 (8th, 9th, 10th) class at least twice a week to demonstrate addition, subtraction, and absolute value one more time. But students often fight drawing a number line for themselves and find it tedious or childish when asked to do it even when it makes the answer clear! Pre-teen and teenage rebellion? A case of sophomoric bravado? I don’t know. I know that with my oldest daughter (age 6), I encourage her to add and subtract on her fingers so that she sees it happening, and I will encourage her to use a number line when we get do more subtraction. (And she’ll do it because she wants to make daddy happy…) We also spend a lot of time talking about number places. My daughter claims to not be able to add two-digit numbers in her head, but when we discuss number places she does just fine. Me: What operations are in this expression? Me: Oh! Look! Hmm…What operations are in this expression? S: Addition and Multiplication (Distribution). Me: Remember, being able to speak clearly and describe ideas well is important. When we multiply a value by -1 we are finding the opposite of the value. So we are really adding “a” by the opposite of this entire sum [point to b+c]. S: Can’t we just distribute? Me: Yes, but you also should anticipate and try to understand what you’re doing. Now we have distributed -1 over the sum. What is the opposite of positive b? Me: What is the opposite of positive c? Me: Good, so we have a + -b + -c. Of course, on the ACT they think that subtraction is a simpler form than “+ -” so we have a – b – c.
(Short version: change subtraction to addition of the opposite (need to write -1), distribute the -1, rewrite any “+ -” as subtraction). Me: We have a – (b+c). So we just change the signs on the numbers in the parentheses like this: a – b – c. Remember, if you see a negative outside parentheses it changes the signs on all the terms on the inside. Get it? Don’t know if you were expecting such a long response, but you did get me thinking. Thanks, Viv! 1. Algebra deals with the signed number system. 3. How much am I moving to the left from position a ? 5. Do I have to do this move in one go ? I like your explanation a lot. Now I’ve got more to think about. Moreover, I’m wondering how we present ALL of this to students. For better or worse, I know I was not taught to do math the way that I am doing math with my students. It seems like I might finally get this right just in time for retirement (25 years from now). This issue is not just limited to Mathematics class. It’s happening in Science classes too. So many people, adults included, think of science as a branch of study where you memorize hundreds of facts that scientists have discovered and declared as gospel. They then parrot those facts and imaging that they are “doing science”, when true science isn’t about memorizing facts, it’s about learning a way of thinking and analysis. Heck, let’s say this is a problem in all classes. Is English class about who can memorize the most lines from Shakespeare, or is it about understanding the stories that Shakespeare was trying to say? The general problem is simply this. For thousands of years of human culture, we’ve been conditioned to believe that memorization skills were the key to higher learning. And for a long time, that was true, because our technology wasn’t good enough to make memorizable facts widely-accessible. People who could memorize algorithms had a significant advantage *because* they were competing against people who had no way of looking up the answers. I don’t know whether to be optimistic or pessimistic about the future. The mere fact that you can even write this blog, and have dozens of people read about it and think about mathematics education, means that you’re already far ahead of your grandparents and their grandparents before them. So things are already moving in the right direction. But I guess one way of thinking about it is that our educational system is not nearly moving fast enough to get to a level where we can complement our advances in technology. So is that bad news because our educational system is slower than ideal? Or is it good news because our technology is faster than ideal? As soon as kids have to find the slope of a line joining two points they will hit such as xdiff = 5-(-7), ydiff=6-2 (for example). This will start them thinking if the calculated slope comes out negative and the line slopes up to the right. Well, it ought to ! There are not numbers and negative numbers, there are numbers for quantity or amount (ordinary numbers) and there are signed numbers, positive and negative, for position and change. I thought I’d shared a paragraph my son wrote when I asked him about his experience with math in K-12. He is now 23 and has a degree in Environmental Science. He has voiced similar feelings about his college-level chemistry and math courses. Throughout my school years in (high school name), I can definitely say that every one of my math teachers was always able to give me a firm understanding of mathematical concepts. When I went on into high school, I continued to learn and use more and more mathematical processes and techniques. However there were times when we were learning so many formulas so quickly, that we were never really introduced to how some complicated formulas came about. I know bringing this up might sound pushy when the teachers are trying to get through their curriculum on scheduled time. I also realize that some students (who aren’t that interested in math) may just want to memorize formulas so they can get passing grades. However there will always be students like me who are sort of uncomfortable about not having a clear enough picture of what they are trying to learn. I think if the school could find a way to teach the raw mechanics of how mathematical formulas and processes came to be and why they work, then not only would this clarify math to struggling students, but it might also cause more students to take greater interest in class.